The Bureau of Labor Statistics (BLS) report for September has revealed that the real estate industry will have to wait a while longer for inventory relief. Summaries from July and August showed impressive growth in the residential construction sector, giving economists a glimmer of hope that an inventory increase was on the way, but Hurricanes Harvey and Irma stifled that growth. The report revealed that total non-farm payroll employment declined by 33,000 jobs last month and residential construction job growth slowed because of rebuilding efforts after Hurricanes Harvey and Irma. NAR Chief Economist Lawrence Yun expressed some excitement about the 2.9 percent wage growth in September, but communicated concern about the lack of new residential construction. There will be fewer construction workers building new homes right now, especially since some will be diverted to rebuilding areas impacted by the hurricanes, Yun said. The industry can expect housing shortages to persist and home prices to continue outpacing wage growth for the foreseeable future, he added. The unemployment rate is at 4.2 percent, and the number of unemployed persons is at 6.8 million, which is 0.2 percentage points down from the previous month’s 4.4 percent unemployment rate and 7 million unemployed persons. Realtor.com Chief Economist Danielle Hale says the decrease in new residential construction is understandable, especially since most construction jobs are focused on rebuilding efforts in Texas and Florida. The BLS says Hurricane Harvey made landfall Aug. 25, which is prior to the September reference periods for the jobs report, and Hurricane Irma made landfall Sept. 10, within the reference period for both the establishment and household surveys. With that said, BLS says the hurricanes made no notable impact on the employment report other than reducing the estimate of total non-farm payroll employment for the month. The BLS guided readers to the Frequently Asked Questions section of the site for statistics about past natural disasters. In September, the pool of unemployed individuals was at 6.8 million. Adult men (3.9) and women (3.9) unemployment rates showed little change from August. Teenager unemployment declined 0.7 percentage points to 12.9 percent. 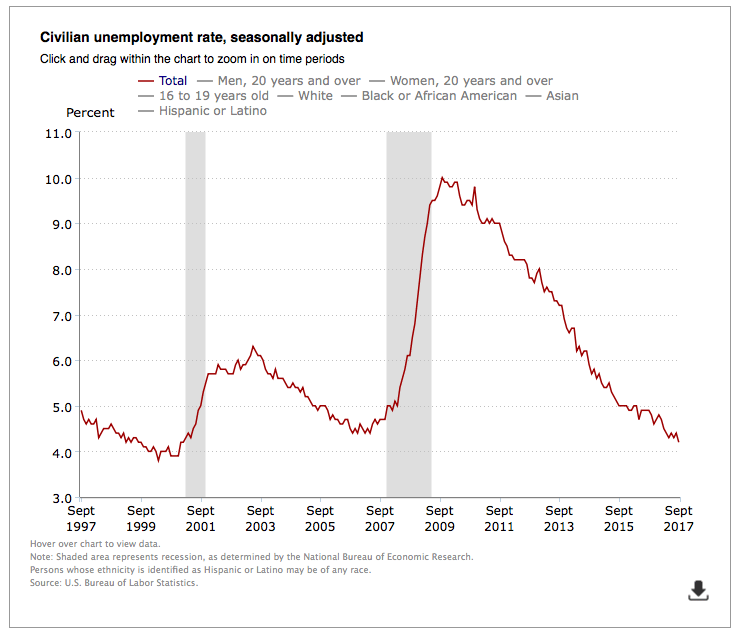 Black unemployment rates decreased 0.7 percentage points to 7.0 percent. Asian unemployment rates dropped 0.3 percentage points to 3.7 percent. Hispanic unemployment declined 0.2 percentage points to 5.1 percent. White unemployment decreased 0.2 percentage points to 3.7 percent. The number of long-term unemployed individuals was unchanged at 1.7 million, making up 25.5 percent of the unemployed total. The labor force participation rate (63.1 percent) and the employment-population ratio (60.4 percent) remain essentially unchanged from August. Workers employed part-time for economic reasons — in other words, individuals who would prefer to find full-time employment but can’t — was unchanged at 5.1 million. Last month, there were 1.6 million people considered marginally attached to the labor force, meaning they are available for work and want a job, but are not currently in the labor force. The number of discouraged workers — people who have indicated that they are not looking for work because they do not believe jobs are available for them — is at 421,000, down 132,000 from last year.